Golf is an exercise in static and dynamic balance. Golfers need to be able to stabilize their bodies along the longitudinal axis while swinging a golf club at a high rate of speed over a relatively large range of motion. Being able to maintain a balanced stance while shifting weight throughout the entire swing allows for more consistant ball placement. Golfers need the flexibility to be able to move through a large range of motion without having to rely on musculoskeletal compensations that can lead to poor performance or injury. Being able to swing through a full range of motion typically improves golf club head speed and allows the athlete to hit the ball further. Golfers need endurance to be able to repeat their swing several times in a single game or match. Golfers must be able to function in all planes of movement. This requires strength, flexibility, power, and endurance throughout the entire kinetic chain. While most golfers focus on flexibility and lower back strength, many training programs ignore upper body strength, grip strength, core strength that includes the hips and shoulders, strength exercises in all threes planes of motion, and explosive power. You are only as strong as your weakest link! Although every individual is different, there are common muscle imbalances seen in regular golfers. Athletes tend to always swing either right or left handed, leading to imbalances in the hip rotators, trunk, and shoulders. Muscles that are commonly tight and need to be stretched include: hip flexors, pectorals and anterior shoulder girdle, wrist flexors, piriformis, and lats. Muscles that are commonly weak and need to be strengthened include: trunk stabilizers such as spinal erectors and abdominals, posterior shoulder girdle and scapular stabilizers, wrist extensors, and hip rotators. Imbalances may need to be addressed not only to improve golf performance, but to prevent injury. Components of a properly designed golf program include flexibility, core stability, strength and power training, static and dynamic balance, musculoskeletal endurance, and aerobic cardiovascular fitness. It is preferable to do most training in a standing position. Many common golf injuries occur because of fatigue at the end of the day as a result of poor muscle endurance. Poor posture or muscle imbalances that force the athlete to rely on compensatory movement patterns repetitively throughout the game can lead to overuse injuries. Most common injuries are sprains and strains of the low back, elbows, and rotator cuff. 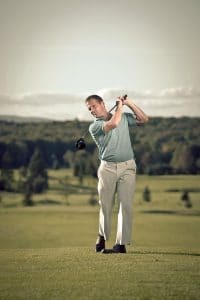 Injuries can also be minimized by working with a golf pro to ensure proper swing mechanics, proper fitting of golf clubs, and a proper progression of gradually increasing the number of swings after a long off season. Option 1.The most effective option is to work one on one with a professional Strength and Conditioning Coach to ensure that you are doing the most efficient exercises correctly. You will first have an assessment to determine your current cardiovascular fitness, flexibility, and muscle strengths and weaknesses prior to beginning a training program. K’s Body Shop will then utilize that information to design a customized program that determines appropriate exercises and intensities so that you can maximize your golf performance and minimize the chance for injury. Since there are no contracts, you can work with your trainer as often or as little as you please. Contact K’s Body Shop to schedule your appointment or get more information. Option 2. If you have a group of golfers in the Twin Cities area who are interested in having a professional Strength and Conditioning Coach oversee your small group strength training workouts, contact K’s Body Shop. This is a great option for training partners to contain costs while still getting some professional instruction. Prices vary depending on number of athletes and location of sessions.